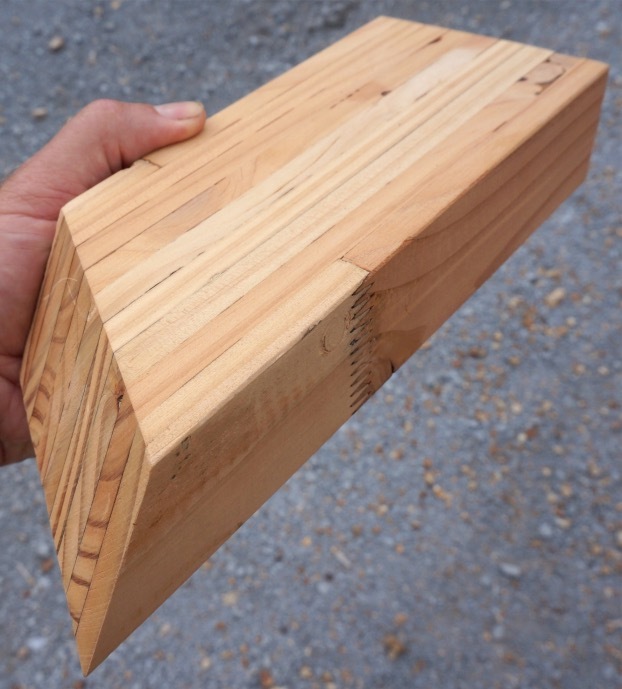 Farm Forestry timbers - Optimised Engineered Lumber (OEL), timber framing for the future? The Specialty Wood Products Partnership is a seven year partnership between central government and the forest industry. It aims to investigate the development of new wood products from locally grown specialty timber species. Research is aimed at identifying new processing options for Eucalypts, Douglas-Fir, and Cypresses, in order to produce high-value timber products. The New Zealand Farm Forestry Association and Farm Forestry Timbers are a partner and our expectation is for high-quality science to be applied to industry problems to generate real opportunities for our forest industry. One of the early opportunities being explored in this programme is testing young small diameter Douglas fir and Eucalyptus nitens in the manufacture of OEL™. Wood from younger trees usually results in lower strength structural products, but this novel approach uses a lamination process to produce a high stiffness structural product with high dimensional stability. OEL™ is made from thin strips of wood that are finger-jointed and laminated together. By laminating wood the stiffness and strength is dramatically improved and the product has very consistent properties, allowing the use of low quality and small diameter logs that would otherwise yield very little value, for a high quality structural product. The key question is "Can this be produced cost-effectively?" The SWP doesn't yet have an answer to that, but has demonstrated that strength and stiffness characteristics are very good from both young Douglas fir thinnings and Eucalyptus nitens. In particular the E. nitens showed excellent stiffness properties, and being very fast growing might hold real potential as a plantation species for structural applications. Douglas fir could also potentially be grown in shorter rotations, improving the economics of the species. WET OEL 2016 from Wood Engineering Technology on Vimeo. I'm thinking there will be somethng around the production process that improves efficiency. This is, after all, only framing and not exactly high value considering what must go into this product. They need to sort the stiffer laminates and glue them on the outside.